Hot New HubNuggets List Published! Breaking News - Content Publishing - Hot Off the Press! News Flash - New HubNuggets Written and Published! The latest list of HubNuggets nominees has just been published. That's right, folks! A fresh batch of golden nuggets cooked up by our talented new HubPages writers is ready for reading and voting on. Each one of these delectable nuggets is a little slice of non-fiction Heaven. Just reading these works will change your life. You'll laugh, you'll cry, you'll learn. To show your appreciation to our Wannabe writers, won't you please show them you care? Take a second to vote for your favourite hub. It's really easy and it's free to do so. The five writers with the highest percentage of votes will get their profile and hub links published in the weekly HubPages newsletter. That means exposure to more than 40,000 potential fans reading the works of those lucky five HubNuggets winners. If you're not sure how to vote, don't worry. Instructions can be found at the top of the voting poll, which is located below the list of Wannabe hubs. Advertisement - What's a Wannabe? In case you're wondering what all this reference to Wannabes means, reading the HubNuggets How-To hub can shed some light on that for you. Shirley Anderson, "There is no such thing as reading too many HubNuggets!" HubPages Communicator of Awesomeness, Ryan (Hup) Hupfer announces plans to vote in the upcoming HubNuggets election. More on page 6. Shirley Anderson charged with reading too many HubNuggets. Trial to begin after weekly newsletter. Indignant Anderson, "There is no such thing!" An full acquittal is expected. Full story on page 11. Theatre goers protesting ProCW's new play, HubNuggets, Hold the Gravy, claiming Gravy World conglomerate was about to bribe the playwright to actually add the gravy. Investigation pending. Details page 4. B.T. Evilpants caught in compromising position with Roger Rabbit's wife. Photos on page 12, film at 11:00, new hub on the subject next week. Gravy World executive, Patty Inglish, mired in sauce scandal, "It was the jackalope!". Investigation will begin next week. Details, page 7. Ripplemaker pulled over in HubMobile for speeding to HubNuggets voting poll, let off with a reprimand. See page 5 for details and photos. Do you like to write? Do you like to hang out online with nice (yet zany) people from all over the world? How about earning a little money, you like that, don't you? Well then, why not join us here on HubPages. Who knows, your hub might be in next week's HubNuggets contest. Warning: Reading Published HubNuggets May Cause Joy, Laughter and Learning. Hubs not approved by the FDA. Can a Die Hard Sonic Fan Ever Root for Portland? Voting Poll: Click the circle located to the left of your favourite hub, then click the "Vote" button at the bottom of this poll. Which one of these sumptuous nuggets is your favourite? We hope that you enjoyed this hot new list of published HubNuggets. Our writers worked really hard to produce some high quality hubs, so I know that you'll join me in wishing all of our Wannabes the best of luck in this week's contest. That's all the news that's fit to print. Remember folks, you read it here first. Get In Shape For Summer With HubNuggets! Have you always wondered what a HubNugget is and how to get in on the HubNugget action? Well, wonder no more! All you have to do is read this hub and all will be revealed. Mackinac Island, Michigan and "Somewhere In Time"
Hi, Denny. Voting choice noted, thanks for elaborating. I believe you are right about most people having a boss like that. 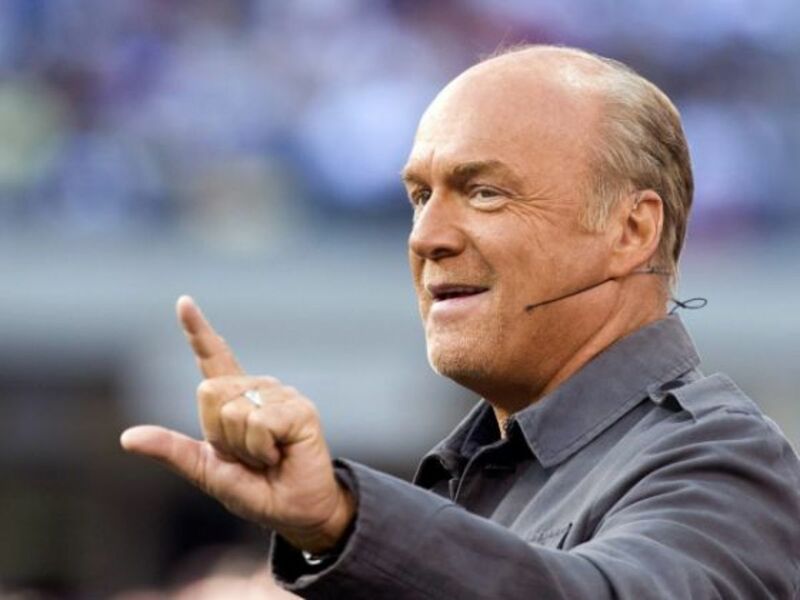 Perhaps it struck a cord in a lot of people, especially with the current economy. Thanks for sharing and for your support of our newest writers. Katy, Katy, Katy. It's supposed to be unpredictable, it's a contest. :) What we have discovered (the HubNuggets team) is that being chosen really gives our new hubbers the encouragement that they sometimes need. Also, it's great practice for them to promote their hubs and draw traffic. Whether they get in the top 5 or not, they are all winners. It also gives others models to look at and think about it as they improve their own hubs because the newbies have to fit a certain standard before even being considered from the sometimes more than 2,500 entries. I know that you've read and voted before and that all the nervous Wannabes have appreciated your support of them. I don't know if that helps at all but I'm glad that you brought it up. Thanks! Well perhaps, but honestly I think this is all as unpredictable as the weather and is not worth the effort involved. Looks like the hostile work environment hub hit a chord with a lot of people these days! Even I left a long comment over there... :) Most everyone has encountered a jerk of a boss at some time or another in their work life. The comments on my hub choice voted for this week were all quite telling and informative too of other people's experiences. All interesting and great hubs, folks, keep writing! Congratulations, everyone!!! Happy hubbing and have fun. THE POLES ARE OFFICIALLY CLOSED. WINNERS WILL BE ANNOUNCED IN THE FORUM VERY SHORTLY. Glad you liked it, Myriad. Thanks for voting! 9 years ago from the bottom of your heart .. ie chennai! 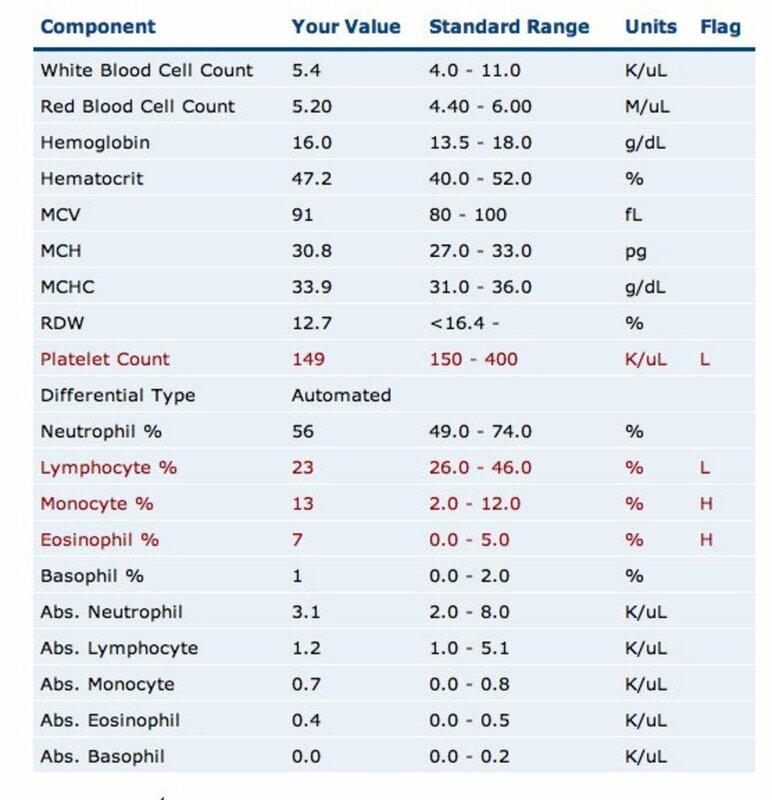 Thanks, MB! Your support is appreciated. Thanks, WS and AM! That's what makes HubNuggets work! Is it wrong if I voted for the competition? lmao I can't deny how great some of the other hubnuggeters are! I'd say 'sorry' for making the choice difficult, but I just can't because it means that we have exceptional talent here amongst our Wannabes. I have done the deed and voted. It was no easy to choose one this week, I'd like to point out. Once again some excellent hubs! My vote is in and good luck to all. Lots of good reading again this week. It was hard again to choose but I finally voted. I'm a little confused re the gravy scandal. I heard that you did it. Thanks for voting, though. What a trooper! Neither bad press nor scandal or even paparazzi can keep you from performing your civic hub duty. Those stories about Jessica Rabbit and myself are nothing but a fabric of lies! I demand a retraction! Also, any and all reports of gravy related malfeasance on my part, have been wildly exaggerated! I still voted, though. Awesome job (except for the scandal thing)! All great hubs AGAIN! It wasn't easy, but I voted. Good luck to all the wannabees. You're welcome, UL (Undercover Lawyer). Very best of luck. If you win, I'll be able to send you an email now. :) Oh, don't forget to promote your hub and increase your voting percentage! P&amp;O, you do have an awfully nice shine on those leaves. Geez, this is gonna be tough. "Oh, and of course, if you think I'm cute then vote for me. =)"
I'm cuter, look at the shine on my leaves. I'm honored and excited (and surprised!) to be nominated. Thank you, and thanks for letting me know, Shirley. I'll change that email notification setting. "Congratulations to everyone nominated even if you don't get the most votes you are all winners. Woo hooooooo!!!!" Congrats on your nomination, Huck. If you didn't know about HubNuggets, then we got to give you a real surprise and we team members love surprising the newbies! DoodleLyn, thank-you so much! Hope you enjoy your hubs and coffee. Thanks for commenting and for voting. Shirley, I love the Hot off the press and headlines format of your hub! Very original and entertaining. 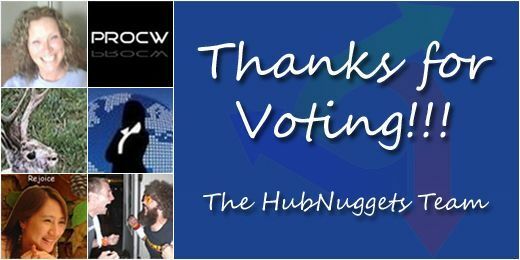 Thanks for another wonderful batch of hubnugget nominees. I am making myself a cup of coffee, then will read them and vote soon. Congratulations to all!! I didn't either before I got nominated HuckR! :) Congrats! 9 years ago from Fredericksburg, VA. Thanks for the nomination! I hadn't a clue such a thing existed. I'm glad they let you off, Michelle! I'm sure they understood that it was for a good cause. Glad you made it for voting, thanks! Richard, Richard, Richard. Of course it's worthy! Don't forget to promote your hub like crazy and drive up those votes. Good luck! Hi! 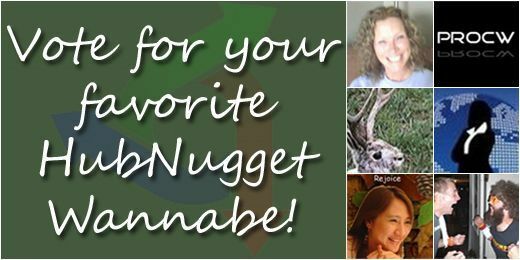 Wow, thank you for adding me to the HubNugget List! That's amazing, I had no idea my submission was worthy. =) Thank you! Congradulations to all of the nominees. I have placed my vote. It's hard to pick just one, isn't Jane? Thanks for voting! EMO, congrats to you for your win last week! Thanks for supporting your hubbers, I know they appreciate it. I know it was the jackalope, Patty. I read about it in the Enquirer, so I know it's true. :) Can't wait to read your book! Now, THIS is my kind of news media! And it WAS the Jackalope! My tell-all book will be out in 2012. Congratulations to all the nominees and a warm welcome. I will be reading all of these nuggets, thanks so much to the team for bringing them to us. Voting later! I voted, but it was not an easy choice. Congrats to all! The hub has only been up a matter of hours and we already have 15 votes in! Maybe we'll break the record this week! Laura, you're a great writer! It's easy to see why your hub was one of the chosen. I have to apologize to all of the Wannabes. My computer crashed (is that the right techy word?) and eventually I got it running again by restoring the system. That means that last week's winners and this week's nominees have not received their titillating form emails yet. Sorry! You'll receive them shortly. Good luck in the contest, Laura. Don't forget to promote the absolute bajeebers out of your hub so that it gets lots of votes! WOW!!! I'm so excited to be in this list. Its so funny - yesterday I started looking up stuff on HubNuggets and I thought, "Oh, I'll never get on that- maybe I'll just try for the HubMob someday".... I had no idea!.... (Charia - thank you!). Its an honor to be among such talent! Thank you very much! Just being acknowledged gives me courage (I'm a shy writer...) and incentive to continue. Thanks again! Aww, BP! You said it perfectly, they are all winners. :) Thanks for expressing your support for our new hubbers! Dame, thank-you for the nice welcome and encouragement to our newbies. I know it will make them feel more comfortable. New people are nice, aren't they Cam? Yeah, I figured this was going to be another tough week when it comes to choosing just one. Thanks for the compliment and for saying hi to our newbies! Congratulations to everyone nominated even if you don't get the most votes you are all winners. Woo hooooooo!!! !